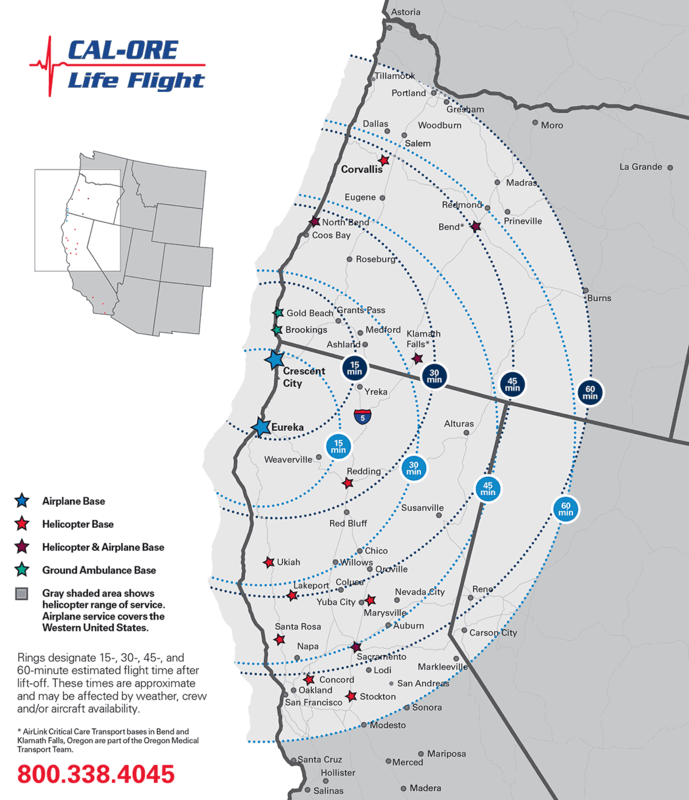 With its fleet of six fixed-wing aircraft, Cal-Ore Life Flight offers 24/7 emergency medical air transportation service to destinations throughout California, Oregon and bordering states (per sending physician’s authorization). Our aircraft and crews are ready for takeoff within 20 minutes of an emergency transport request. They provide bedside-to-bedside service, staying with each patient from the sending location until they are safely at their destination hospital. Since 2007, Cal-Ore has been accredited by the Commission on Accreditation of Medical Transport Services (CAMTS), which sets the gold standard for patient care and safety for air medical transports. If you would like to call our Administrative Office, the number is (541) 469-7911. If you need to reach our 24/7 Emergency Communications Center, the number is (800) 338-4045.